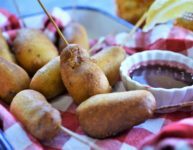 Mini Chipotle Corn Dogs with Blackberry Honey Mustard | Recipe For A Party | Life is a Party, So Celebrate! 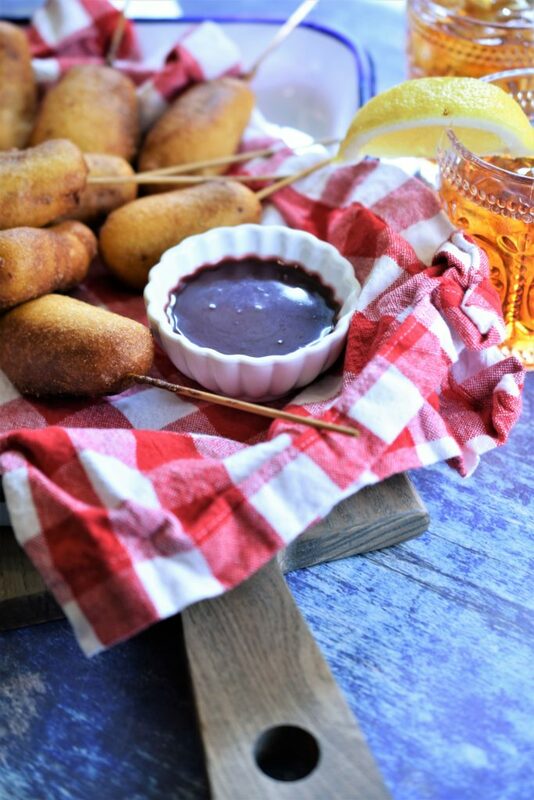 Do you have fond memories of eating snow cones, cotton candy and corn dogs at fairs and carnivals as a kid? Growing up in a small town, I really looked forward to summer when the carnivals, fairs and the circus came to town, that meant there was something to do besides play doorbell ditch or toilet paper your friend’s house to kill time… ha, ha (ok I did it once, maybe twice) Do you crave corn dogs from time to time but when you eat them, you feel as if something is missing? 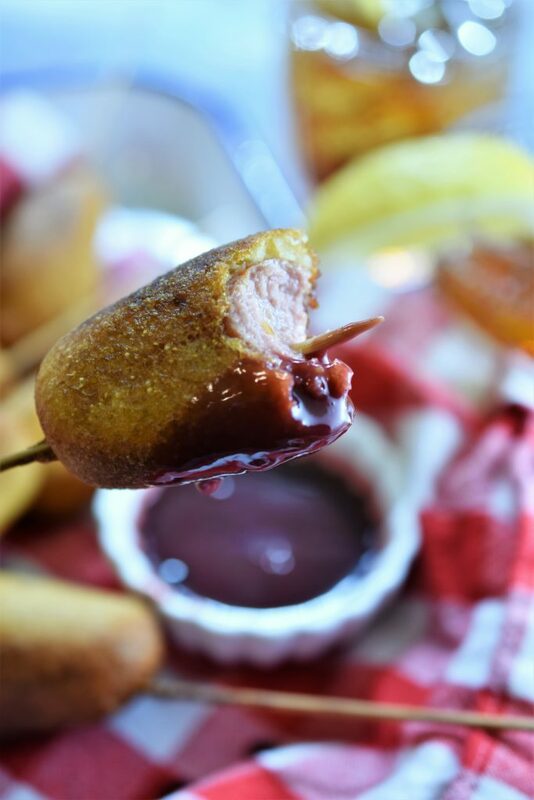 No need to leave your childhood memories of this carnival classic behind, make my new recipe for these delightful mini chipotle corn dogs with blackberry honey mustard and wow your party guests with my unique spin on the all American classic hot dog on a stick. I love chipotle chilies in adobo and I have quite a few recipes on here with these smoky and spicy little wonders of the culinary world and they give so many flavors to a dish. My recipe comes together quickly with corn muffin mix for a fun appetizer that your party guests, family and kids will like. 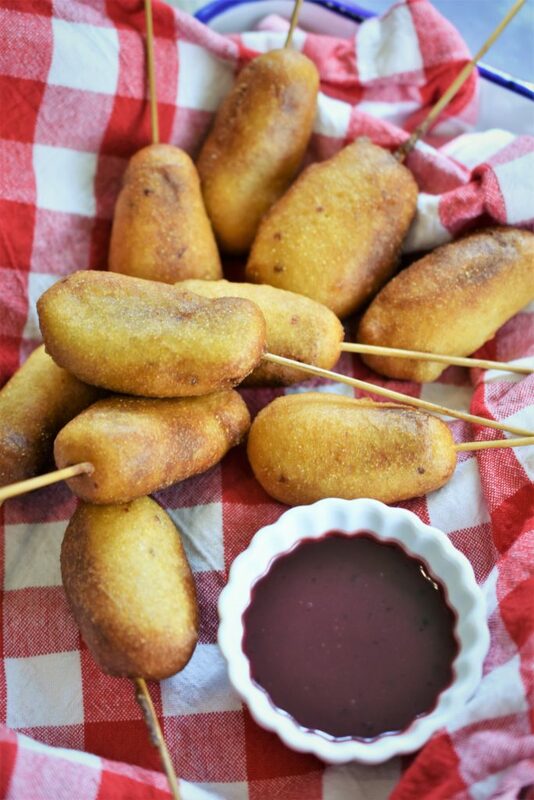 The chipotle gives these corn dogs a nice smoky heat combined with the sweet corn bread batter without being too spicy. You just may want to skip the Ferris wheel and run home to make these! 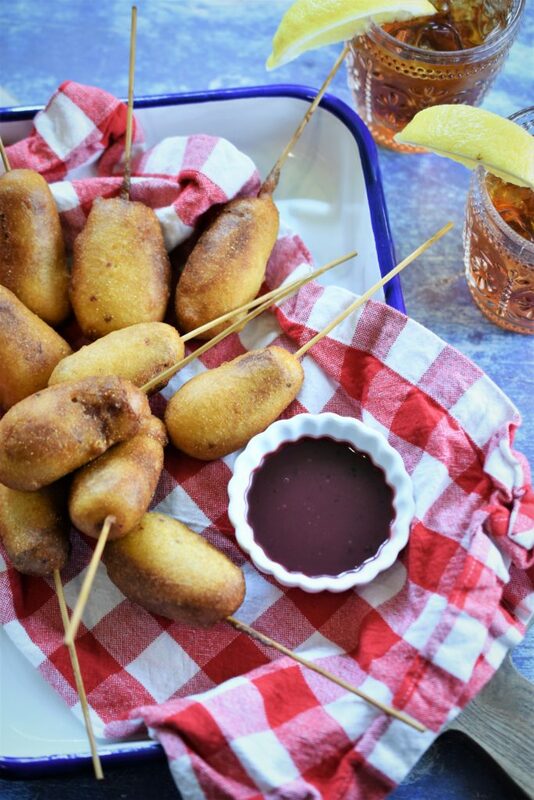 The classic corn dog updated for today’s sophisticated palette and perfect for your next cocktail party! In a medium mixing bowl, whisk the corn muffin mix, flour, salt, egg, buttermilk and the minced chipotle chilies until well mixed, set aside. While oil is heating, cut the hot dogs in half and skewer the flat end and push the skewer ¾ way up the hot dog. 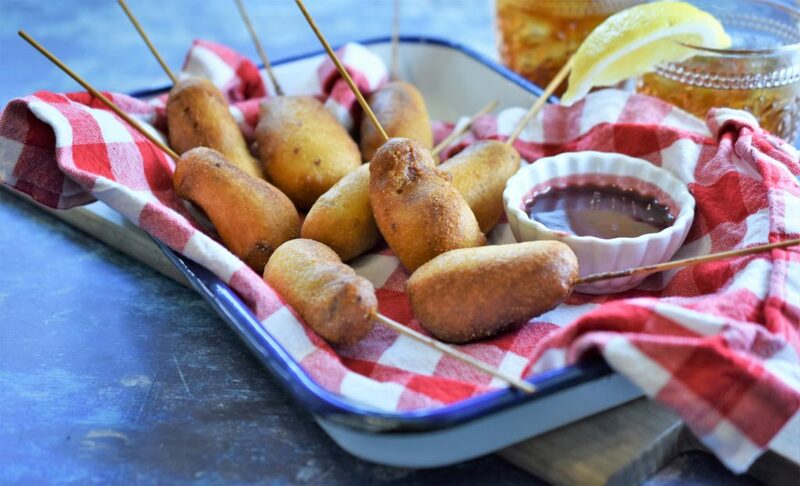 working in small batches of 4 to 5, dip each one in the corn bread batter until well coated and carefully place each corn dog into the hot oil and fry for 3 to 5 minutes or until golden brown, turning occasionally so all sides cook evenly.